Hi there and welcome if you’ve just made your way here for the first time through Coolfer’s gracious plug. If you’re all and only about music, you can click on the music category over on the right. The Business Quandaries category also has a lot of music coverage. Hope you enjoy what you find here, I’m always interested in feedback and tips, and don’t be shy about clicking that RSS feed on your way out :) Thanks for stopping by. Live or Virtual? Even I Choose Live. The internet is often cast as “the virtual” while face-to-face, or as one scholar better termed it, “body-to-body” communication is seen as the locus of all that is real and authentic. Having studied how people use the internet socially since the early 1990s, I’ve always been very wary of the whole concept of “virtual,” with its implication that what happens online is ALMOST real enough to seem like it’s real but can never really truly be Real. I know too well that for the overwhelming majority of people the overwhelming majority of the time, what happens online is just part and parcel of our everyday lives — no more or less real than a phone call, a memo, a newspaper or even … an in-person conversation. My own research is among studies showing that online interaction isn’t much better or worse than any other kind of interaction and using the internet in relationships doesn’t make them any better or worse. My position is sometimes interpreted to mean that I think the internet can be substituted for face-to-face communication. I don’t think this. There is something special about shared physical presence that no medium can ever replace. The internet lets us build connections that we can later meet in space, it lets us maintain connections that formed in space, it gives us a way to coordinate how to meet in space. It supports face-to-face communication. I was a little tempted to sneer, but I totally understood. Because the second thing that’s got me thinking about the importance of shared presence is the fact that I’m soon to go further than I ever have before to see a show by a band I love. Now this is coming from someone who logged tens of thousands of miles in the 1980s following REM, the dBs, Camper Van Beethoven, Dumptruck, Thin White Rope, Big Dipper, Love Tractor, and other bands I loved around the midwest. It’s even coming from the girl who said “yes” when a girlfriend called her up 3 years ago and said “fly to Denver, meet up with me, and go see REM.” Live music has always compelled me to come. If you’ve been reading this blog for a while or know me, you know that a few years ago I fell very hard for the Norwegian band Madrugada. They have never toured the US. Last summer, their guitarist passed away and in addition to mourning what was way too soon a passing, I also selfishly mourned that I never got the experience of seeing them live. Two years ago I sat exactly where I’m sitting right now and looked at ticket prices on Expedia trying to figure out if I could get to London for their show there. I decided it was just too indulgent and didn’t go. I heard a bootleg. It wasn’t that great a show. But boy do I wish I’d gone. Before his death, they had almost finished a record. The remaining members finished it, put it out, and more or less announced the end of the band saying it didn’t make sense to go on as Madrugada without Robert. Seemed fitting. But the record is good. Really really good. And they were a band that loved to tour. And you could listen to that record and hear the songs calling to the men who made them “you have to play me live, you know you have to, you know it, you know it.” First they played one show, invitations only, for 500 people and 30 fans (they had a raffle, 10,000 entrants in only a few days). It was hard to imagine that with that taste they could really spend the summer cooling their heels in their urban apartments when there were festivals all over Europe. A few weeks later they announced they were going to tour after all. Sit home again on account of “it’s too indulgent”? Not an option. It took an absurd amount of juggling and coordinating, but in a month I’m going to see them 2 nights in a row in Denmark. The next week I’ll give talks in Copenhagen, Toronto, and Montreal then go camping with the family. One might question my sanity. But what I keep thinking about when I ponder my motivation for going so far out of my way to see them, especially in the wake of Robert’s unexpected passing, and when I think about all those basketball fans in the street, is that being together in person with all your attention on a passion so important to your sense of what makes you you, is such a powerful way to affirm LIFE. To celebrate the fact that we are alive in the same time, the same space. We are alive together. I found Madrugada on the internet. I met the people who’ve invited me to speak in Copenhagen and in Toronto on the internet. I’m grateful for the chance to see them in person. I recently read Wendy Fonarow’s book Empire of Dirt: The Aesthetics and Rituals of British Indie Music. It’s easily one of the best audience ethnographies I have read, in part because she focuses both on the details of behavior — the microways in which audiences at indie gigs organize themselves — and offers a compelling macro-explanation of what’s going on here. The methodology is also impeccable – it is a true ethnography based on years immersed in the scene, making rigorous records, and analyzing in copious detail. To briefly summarize, she argues that there are three audience zones at indie gigs. The people up front are focused on the band, they are close, there is a lot of bodily contact, it is supportive but rough, it is all about emotion. The people who hang out here are mostly young. In Zone 2 are people a bit older, not so enraptured they need to be up front, but still attending to the music. In the back — Zone 3 — are the professionals, the ones who’ve seen so many shows that it’s old hat and they’re more interested in seeing one another. She’s also got a pair of dead-on analyses of guest lists (the different kinds, how people manage asking for guest list tickets given all the face issues at stake) and placement of guest passes (short story: more in-crowd, more concealed). Fonarow is an anthropologist, and she draws on theories of ritual and aesthetics to argue (and I don’t begin to do her argument justice) that essentially the indie gig is serving as a music-based trance-like coming-of-age ritual akin to drum-based rituals you see all the time in places like Africa. During the ritual transformation, fans come of age as they gradually start to become more protective of their bodies and practical about other life-responsibilities and move from the front of the stage (pure feeling) to the back of the room or leave altogether (adulthood). At the time I read it I thought this analysis might be a bit over-analytic and theory-happy. But the more I think about it, the more I think she’s really pinpointed something in the essence of our engagement with the objects of our fandom and social scenes around them that is relevant far beyond pop music studies. I find it speaks to my own experience, and it helps me understand things about my own fandom. There’s kind of a gap between people who do fan studies of tv shows and those who do fan studies of music. I wish they’d read each other more. For the tv crowd, this book’s a really good touchstone. And it’s fun to read! As they say round here, ROCK CHALK! KU won Saturday night, which you either know or really don’t care about in the least. I watched at home on TV. I live close to downtown where people had been hanging out in anticipation of the game in bars & restaurants all day long. The split second the game ended I heard a tremendous roar and it just didn’t let up until well after I’d fallen asleep. I grabbed the family and we headed downtown to check out the scene. It was a nonverbal ritualistic primal phenomenon. 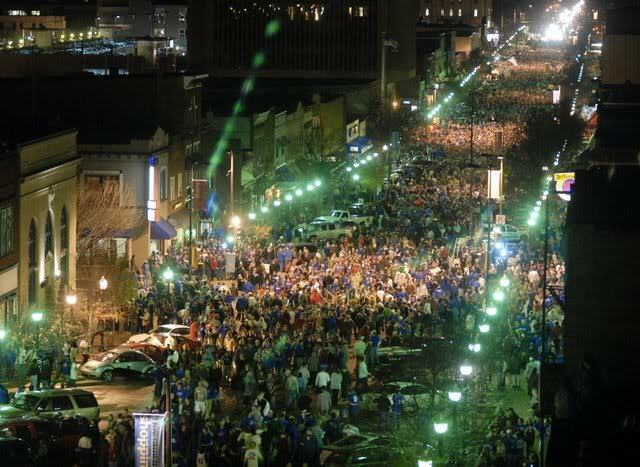 Thousands of people in blue KU shirts (“I’ve never seen so many people wearing the same shirt” said my son), barely talking, just walking up and down the streets and sidewalks with no particular destinations screaming, hooting, hollering and high-fiving. And smiling smiling smiling. And even in their chaos, so nice, saying “excuse me” when they bumped into you and being extra nice to the kids. 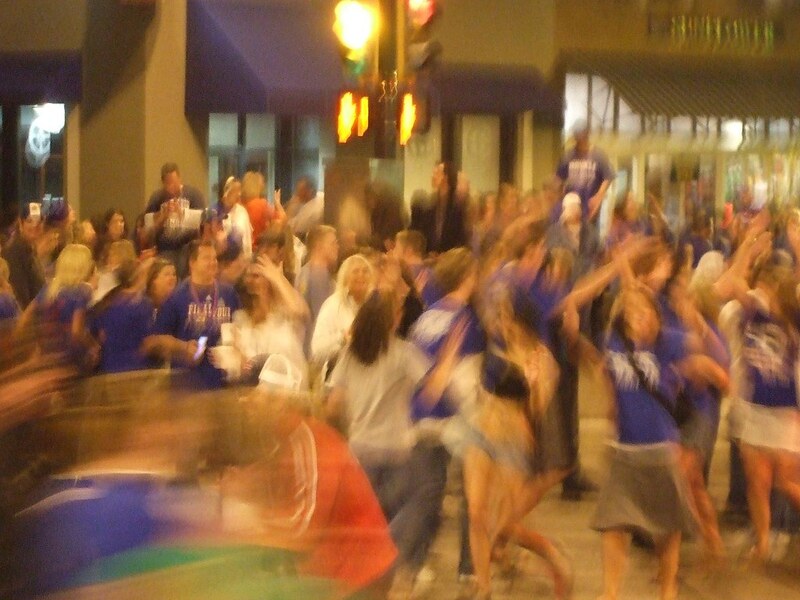 I felt far more like an observer than participant, especially since I’m a good deal older than most of the revelers and because I just don’t identify with KU basketball in that personal way. But it was impossible to deny the pure collective joy that filled the town. The internet is great for information pooling and network building, and it does alright at collective emotion, but there is simply no substitute for sharing physical space with other people feeling the same thing. It builds, it magnifies, it takes on a life of its own. It allows people to TOUCH. This is why fans will always create opportunities for collective face-to-face experience. And why they will use technology (mobile phones were the obvious interpersonal coordination devices last night) to create more opportunities to share their fandom together in space. Here’s hoping KU win tonight!